Tune in and tune up your mind, body and spirit with a Wellness Rhythm Circle. 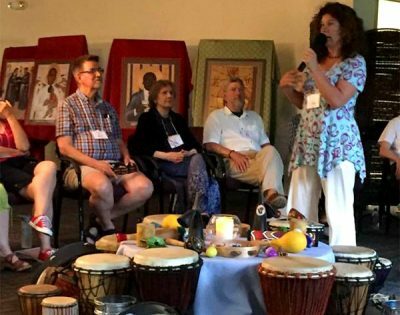 This 90-minute experience incorporates drumming, breath work, chanting, movement and guided meditation. Learn about the principle of entrainment and how the rhythms in our life can harm or benefit us. Reduce your stress and enjoy self care as you bond with others and create connections through the joyful vibrations of the drum. Great for health care settings, rehab & recovery groups, assisted living facilities, women’s groups, mindfulness centers, yoga centers and schools. Katy brings a rich joy and spiritual depth to the amazing art of drumming! Her leadership in a group promotes an increased self-awareness while building community relationships through a shared rhythm experience. 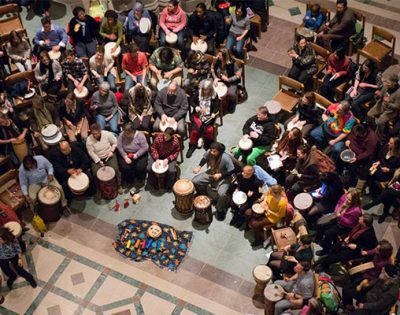 A drum circle is a creative expression of energy, harmony and hope. No musical experience is necessary and all age groups benefit. Katy has helped our church build collaborative relationships with staff, increased energy and healing amongst our caregivers, and created space for cooperation and understanding with our youth and lay leadership. At our Health Equity Drum Circle, Katy helped to facilitate our attempt at the world largest drum circle! Katy was perfect for the task. She brings unbounded energy and enthusiasm to everything she does. We are so thankful to have Katy on our team. She has been a tireless supporter of our work to promote equity in health and well-being in Maryland.